A PONTELAND store has expressed its delight that three charities which received donations from it for various fundraising events have raised an impressive £2,000 between them. 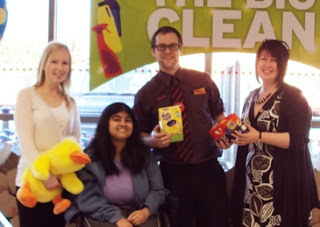 The organisations that Ponteland Sainsbury's supported were Cambo Wraparound, which provides after school care in a rural environment, Leonard Cheshire Disability which runs Bradbury Court in Ponteland, a residential centre for disabled adults, and Legacare, a new charity that provides free legal advice to long term and terminally ill people. Store Manager Jason Harmer said: "It was a privilege to be able to help these local charities to achieve this superb amount and to assist in spreading coverage of the splendid work done by all three charities."